Recent sculptures that focus on how we exist and define wilderness. 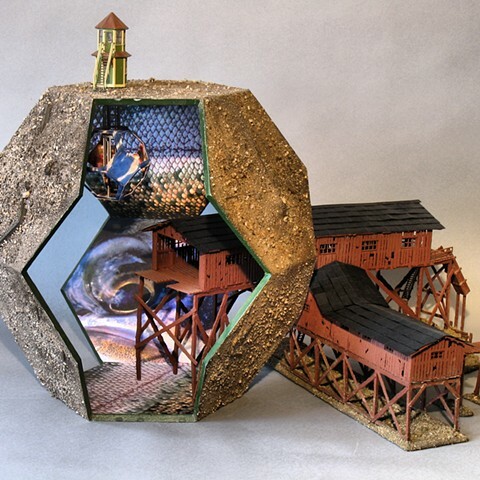 Oakland based artist Tony Bellaver creates mixed media sculpture and drawings inspired by his love of hiking and nature. He incorporates maps, drawings, photographs and found foliage gathered on his many hikes to create texture and meaning in his diary-like works. While backpacking over hundreds of miles at a time, Tony makes small journals during his treks to capture the experience of the places hes traveled through. This exercise gives him a better understanding of himself as an element in nature rather than the focal point. When back in his studio, away from the wilderness, the journals become the source for larger sculptures, sometimes in book form, of what is in his mind. Using materials such as wood as the framework, plus found objects and photographs he tells a layered story of his journeys. Tony grew up in the South Bay where he was somewhat indifferent to the typical high school sports hero. Riding his bike and hiking to fishing spots with like-minded friends were his norms. After undergraduate school in San Jose, he went to the San Francisco art institute for graduate school to study painting and sculpture. Along with his career as an artist, exhibiting nationally as well as internationally he spend a good amount of his summer as a National sierra Club trip leader. His trips have often are theme oriented, often the content of connecting the artist with the wilderness experience are the paradigms for his trips in the High Sierra as well as the Rocky Mountains. Visit him at his blogs as well.